The above listed item is from the Ptolemaic Period,(332-30 B.C.E.). This wonderful "Ptolemaic Isis as Queen and Hathor Relief" was carved from limestone. We acquired this exquisite piece from a select private collection and its provenance is from Alexandria, Egypt. 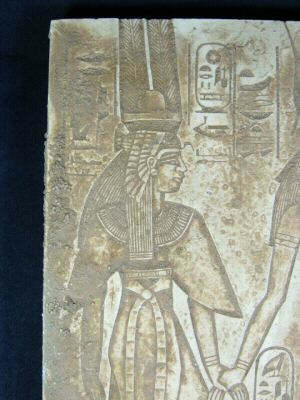 This queen as Isis is depicted in double plumed Atef crown with Aten sun disk and Nekhbet headdress. She is wearing elaborate necklacing, a long and flaired priestess-like gown tied with a Tyet knot sash. Holding her hand is the goddess Hathor depicted in a horned Aten disk headdress with Tyet knot and wearing a tight, halter top style gown. 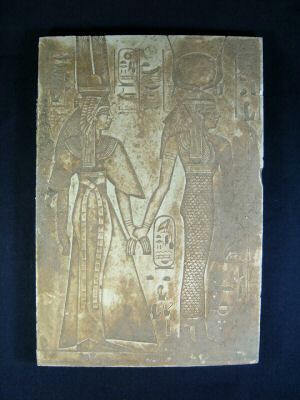 There are two cartouches and several hieroglyphic inscriptions refering to royalty. This lovely relief fragment was at one time part of a larger tomb or temple panel. This rare item is intact with areas of age wear. The reason for the item being available is due to the vast extent of archeological findings, thousands of years in Egyptian burials and also the proliferation of these said items in older private collections worldwide. The timeline on our items is a suggestive guideline for the listed Egyptian Period.